Completing an Environmental Reviews allows schools to gain a realistic picture of their current environmental performance inside and outside the classroom. The reviews are designed to be undertaken by the Eco-Committee and should enable pupils to see how well their school is performing across all ten Eco-Schools topics. You must use one of our FREE Environmental Reviews as you will need to submit this when applying for or renewing your Eco-Schools Green Flag. We have reviews suitable for Early Years and Primary. Your school should not pay for additional support from third parties to carry out your Environmental Review. In order to achieve the international Green Flag award a school must meet the following criteria. The Eco-Schools Environmental Review covering all ten Eco-Schools topics is completed by pupils, with adult supervision. 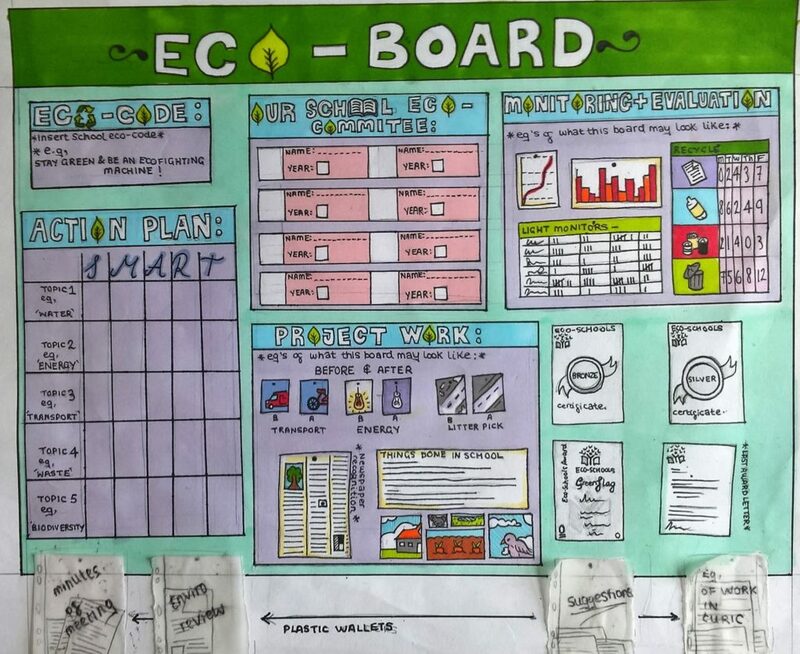 A copy of your Eco-Schools Environmental Review must be displayed on your Eco-Board and the results communicated with the whole school. It is compulsory for the Green Flag award that your Eco-Schools Environmental Review is updated every two years to coincide with your Green Flag renewal application, however, best practice is to complete it every year. Please use our FREE Environmental Review templates as you will need to submit this document when applying for or renewing your Eco-Schools Green Flag. Please log on to your Eco-Schools account to find more resources. Everything you need to know about completing your Environmental Review. Who carries out the Environmental Review? On our website we have differentiated Environmental Reviews that are designed to be completed by pupils. Either the whole Eco-Committee can complete the review, or the topics can be divided between different classes to encourage a whole school approach. if your pupils would like a challenge or you are a multiple Green Flag school then why not try our Secondary Environmental Review! A third party is offering to complete our Environmental Review (for a small fee) should we ask them to do it? No, we never recommend paying for third party support in your Green Flag application. If you feel like you need any support please do not hesitate to contact the Eco-Schools team who will be happy to help you free of charge. Do we have to complete the Environmental Review for each of the ten topics? Yes, you have to complete the review for each of the ten topics, but we have specifically designed it so it is child friendly and does not take up too much time. They can be completed in an Eco-Committee meeting or even across one (or several) lunch times. I don’t know the answer to one of the questions on the Environmental Review, what should I do? If you don’t know and can’t find out the answer to any of the questions on the Environmental Review, don’t panic: just leave it blank. It may mean you should think about working on this topic in the future. Our Environmental Review is messy and has been filled in by the pupils is this a problem? No this is great – it is exactly what we want to see as it shows it has been completed by pupils. Just scan or take a photo of your Environmental Review and upload this for your Green Flag application – we are all former teachers and are quite used to interpreting handwriting! We got a bad score on our Environment Review, what does this mean? Do not worry about your score on the Environmental Review. You are at the beginning of your Eco-School journey and the Environmental Review has been designed to provide ideas for your Eco-Committee as well as audit your school. As part of Step 6 Monitoring and Evaluation you could carry out the Environmental Review again to see if your results have improved. I?ve completed my Environmental Review, now what do I do with it? First of all, you need to ensure that the whole school is aware of the findings of the Environmental Review. Next, your Environmental Review should be displayed on your Eco-Board. You will also be asked to submit your Environmental Review in the final stages of your Green Flag application. I am a Green Flag renewal; do I have to complete another Environmental Review? Yes, it is compulsory for the Green Flag award that your Environmental Review be updated every two years coinciding with your renewal application as this will help to inform you what topics you can work on for your renewal. If you prefer, you can carry out your Environmental Review yearly. At St Patrick's our Eco-club has enthusiastic young members and older, more experienced 'Eco-Warriors' working together, learning from and inspiring one another. Our older children, who act as leaders and mentors, led the Environmental Review by working with groups of younger children, encouraging them to discuss their ideas and opinions whilst making notes. We then used all the ideas and information to create our Action Plan, ensuring that the children's views and ideas were at the heart of our planning.